Progressive Feminist Gets Booted From Twitter. Here’s What She Said That Got Her Busted. 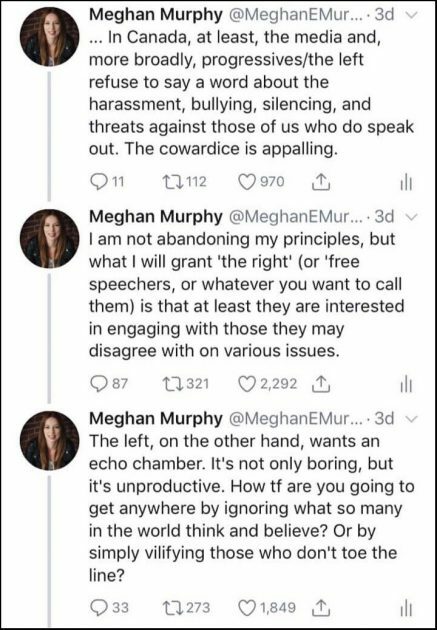 Founder of the Feminist Current website, Meghan Murphy, who is an avowed progressive feminist, has been officially booted from Twitter, giving her a small dose of what it’s like to be a conservative on social media on a daily basis. 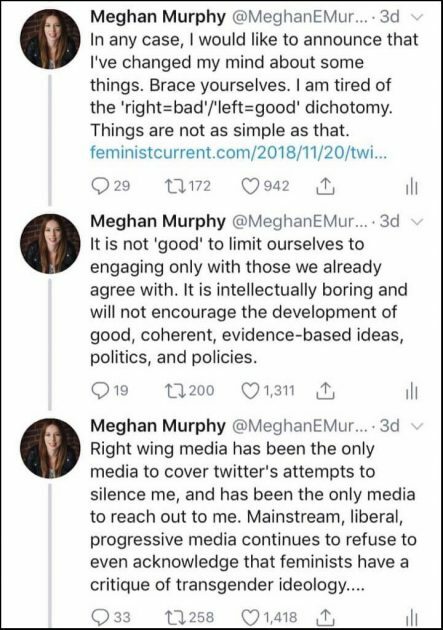 What did she say that raised the dander of the “woke” folks over at the social media giant? She criticized the transgender movement. Free speech is apparently something that’s dying a rapid death here in the land of the free. Murphy, a self-described socialist and radical feminist, has been an outspoken critic of the transgender activist movement, claiming that it has an outsized sociopolitical influence, especially in her native Canada. In order to regain full access after having violated Twitter’s rules regarding “hateful conduct,” Murphy deleted the tweets. She then complained publicly to Twitter, asking if she was “no longer permitted to report facts” on the social media platform. For this, Murphy claims that she was suspended for half a day, and told by Twitter to delete her public complaint. 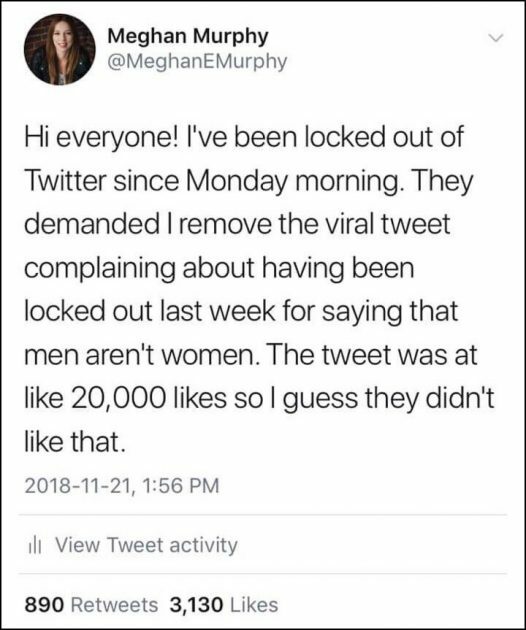 Murphy was notified by Twitter on November 15 that her tweets had once again violated the company’s “hateful conduct” rules. This is f**king bulls*** @twitter. I’m not allowed to say that men aren’t women or ask questions about the notion of transgenderism at all anymore? That a multi billion dollar company is censoring BASIC FACTS and silencing people who ask questions about this dogma is INSANE. What ARE we allowed to say here??? How tf is simply saying ‘men aren’t women’ hateful??? I am losing my goddamned mind over this. Enjoy your brave new world, sjws. Here’s your f***ing social justice … I’m assuming my account is going to get locked again simply for speaking about this. But this is not f***ing ok and I’m not going to let it go silently … Trans activists have been targeting my account for a few months now. Either someone at Twitter or with an in at Twitter has been combing through old tweets and reporting them for “hateful conduct.” Twitter seems to instantly shut my account down without a second thought. How sad is it that the only folks willing to give Murphy a fair shake are individuals on the right? The left, who claim to be a balanced movement that is tolerant of all people, regardless of their views, religion, and race, has no interest in engaging with ideas outside of their narrow view of the world. The left is not at all about tolerance. They are about groupthink. If anyone dares to think outside the hive mind, they’re immediately banished from the movement. Thinking through issues on an individual level is simply not acceptable to these people. Perhaps this whole experience will serve as Murphy’s wakeup call to the many, many inconsistencies in the progressive movement? It certainly seems that’s what’s happening.